Low-lit venues leave you squinting helplessly at your sheet music or playlist? The XtraFlex2 LED Music Stand Light won't leave you in the dark-this breakthrough music stand light harnesses the astonishing brilliance of two LED's, making it a compact yet powerful music accessory. Bright, yes-but unlike incandescent bulbs LED's actually increase the contrast of the words and notes on your sheet, making for a far more comfortable read. Set the light intensity by pressing the button once or twice. 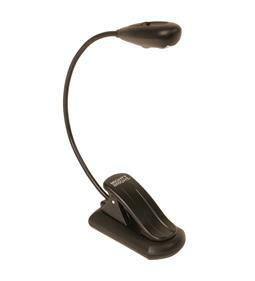 Clip on the light and twist the head to set the perfect angle - the gooseneck obeys your every whim. The clip opens extra wide to keep your hands free when it matters most. If the battery runs low, plug it in and play on.